DesignThinkers, Canada’s only annual conference for visual communicators, is a must-attend for informed, forward-thinking creative communications and design professionals. At this inspiring two-day event, we offer in-depth analyses of trends and best practices in branding, design thinking, design management, communications technologies and user experience with a range of opportunities to exchange ideas with colleagues, new and old. Attendees leave with a reconsidered and refined design or creative process, feeling inspired, refreshed and connected to the creative communications community. “It was great to be around and hear from other designers. As the only designer at my current work, I can feel removed from the design community at times. After being immersed in "my people" for a couple days I felt re-energized and inspired to come back to work and tackle all my projects." “I loved the venue. It was so nice to be able to hear everyone speak and not have to rush to different rooms and have to pick from different talks. This way you could hear all the speakers and it was great knowing that everyone had seen the same speakers and you could then discuss the talks together." "It was fantastically organized!!! The event itself was so well put together. I loved the lightning talks, too!" “I loved the flow. Starting with a networking session was a great way for someone like me, attending the conference alone, to make friends for the day. Then I loved sitting back and taking in all these amazing speakers, one after the other. I found the talks so valuable, I didn't feel like I was craving any other 'workshop' or 'discussion' elements!" “Every session was geared specifically for designers and the challenges we face." “Loved the variety of speakers, how informative the talks were, the calibre of the lineup in terms of what is actually happening in the design world today - and it's always a joy to be in a room with fellow designers. Being able to interact with the speakers in the foyer and at the Delegate Party is always a delight." 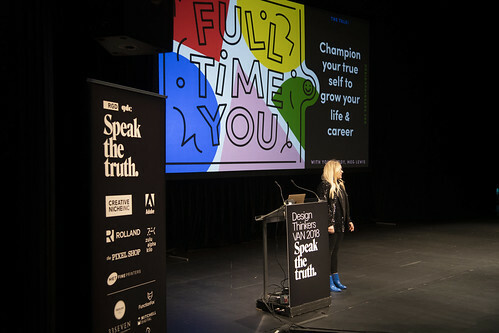 “The chance to meet some of the speakers, make new connections and be challenged in my career as a designer." Like the toonie, there are countless examples from the world of design where cultural, economic and political forces have affected creative work, for better and for worse. As designers, it’s up to us to acknowledge the influence of these factors and try to avoid the mistakes of our past. Over the next few months, we’ll reflect on the complex histories behind other Canadian designs leading up to the 20th year of the DesignThinkers Conference. This event has spanned massive changes in the communication design industry, exploring the innovations and disruptions that inform, inspire and influence the world of design today. Join us in Vancouver this May to continue the conversation. The Association of Registered Graphic Designers (RGD) is a non-profit, professional Association that represents over 4,100 design practitioners, including firm owners, freelancers, managers, educators and students. Through RGD, Canadian designers exchange ideas, educate and inspire, set professional standards and build a strong, supportive community dedicated to advocating for the value of design. This community of like-minded professionals has access to professional development, resources and a vibrant exchange of information. Learn more about the Association. If you are attending your third or more of our DT thinkfests in Vancouver, you will be recognized as a DesignThinkers Master, demonstrating your keen interest to connect with and grow alongside your ever-evolving design colleagues. A design leader for 20+ years. After closing my business, I have spent 10 years creating and establishing the in-house Graphic Communications Program for the Seabird Island Band. Focused on leading the team to develop quality promotional materials creative, inviting, legible and readable. Carolina is an accomplished designer, entrepreneur, creative director and educator. A graduate from Emily Carr University, Carolina has been a strong contributor to the graphic design culture in Vancouver. Modernized the brand of Science World; design educator and business owner in strategic design. Ashley is an experienced designer and marketing specialist with a focus on branding, print and digital. Between her work as an in-house designer and her own design business, she has helped build the brand of countless companies across the public, private and non-profit sectors. Wafé was born and raised in Tunisia. She completed her MA in Arts and Visual Cultures in Paris, France and moved to Vancouver, BC in 2013. She currently works as an in-house Creative Lead with a non-profit educational organization and runs her own design business Hidden Artisan on the side. Deeply motivated by her students, Karin works with local communities creating an integrated approach to learning. As an educational leader at the University of the Fraser Valley and CGD, her focus is on the future of design practice through program development, collaboration, teaching, and research. and has been an award show judge multiple times. Big hearted problem solver, collaborator and (human centred) design thinker and a teaching faculty at VIU and Capilano Universities. Jackie (CGD & RGDA) has dedicated her design skills over the past 13 years to teach, learn and practice the distinctions of design for positive impact. A career spanning agency, freelance, and in-house have fueled the storytelling beyond collateral. Bringing that clarity to creative workshops at international conferences and giving back locally through “Creative Life” (DTES) and as a Communication Strategist for an anti-human trafficking coalition. Parker is the principal and founder of Harc, a Vancouver-based branding agency filled with kind-hearted designers and strategists who build brands and websites for organizations that improve the communities around them. Emrys is the Director of the boutique studio Rocketday Arts, which serves clients in the arts, in education, in environmental science and conservation, and in humankind’s search for meaning. He recently served as Vancouver Island President of the Graphic Designers of Canada. Shenelle is an award winning, multi-disciplinary senior graphic designer with a passion for visual communication. She is currently an in-house designer and strives to maintain two things in design: simplicity and clarity. As Lindon Leader said, great design is born of those two things. An ideas person and hands on creative, Lisa has been designing for over 15 years. Working on a diverse range of brands as creative director, graphic designer, art director and lead creative, Lisa has extensive experience in design and branding – something she is truly passionate about. Matt Warburton is the founder and co-principle of Emdoubleyu Communications + Design and since 2014 he has been the design manager for UBC. He continues to service Emdoubleyu clients such as Canada Post and and Obsession: Bikes, working with his wife Lynn who is a communications expert. What is a ThinkTank? The following organizations have displayed a commitment to creativity, design thinking, and ultimately to their employees by sending three or more members of their team to Vancouver for DesignThinkers.